Zoey started school this week! Yes, I know you know. Yes, I know I’ve written about it ad nauseam. And yes, I’m going to write about it again. Right now. Zoey started school this week! She goes two days a week for two hours each day. In some ways this is not a lot of time. It’s not even enough time for me to really go home and accomplish anything. So, instead, I go to a nearby bakery/coffee shop, order a tea and a pastry, and lounge on the couch. Oh, and I also look very busy and important typing on my laptop. Very busy. And important. Did I mention that I’m important yet? Part of my typing was, naturally, updating by Facebook status to “Child FrEEEEEEEEEEEEeeeeeEEEEEEEEE!” But for all anyone knew I was finishing up my book, single handedly bringing down the republican party, or any other number of important things. Then I go pick up Zoey. She smiles hugely when she sees me. She tugs me around by the hand to show me her art work, the dolls she played with, the sink where she washed her hands. She points and then pulls on my hand just a bit more for emphasis. She looks up at me and her face, her entire body, is glowing with pride. Pride. It’s an amazing thing to see my daughter full of herself in the most wonderful way. 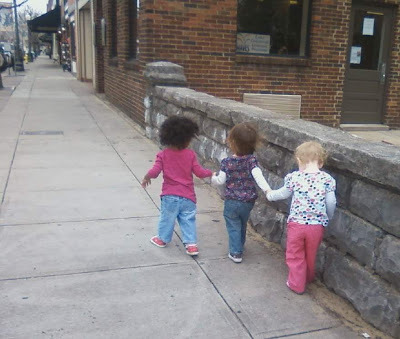 It’s an amazing thing to see my daughter walk hand in hand with her new friends. And that 4 hours that in some ways isn’t a lot of time? Well, it’s just enough time to help me remember all the things I love about my daughter. It’s enough time to make staying at home with Zoey today, a non school day, seem relaxed and, dare I say, special. We went grocery shopping this morning. We didn’t hurry. We sang songs. We chatted. I enjoyed having my daughter gaze up at me, crinkle her nose, and laugh. I payed attention to how it feels when she holds my hand, when she buries her face in my neck. We’re all just feeling so proud and appreciative around here that we’re thinking of putting Zoey in school for 3 mornings a week over the summer. Imagine how busy and important I can pretend to be then . . . This entry was posted in Zoey on March 11, 2010 by joslyne. >Can I send my kids to you (you know, after I get some somewhere, soonish) from Laos? Just for a couple of weeks a yea… scratch that, a couple of weeks a month? You can send Zoey back with he/she/them for a while in return, if you want. Just a thought.